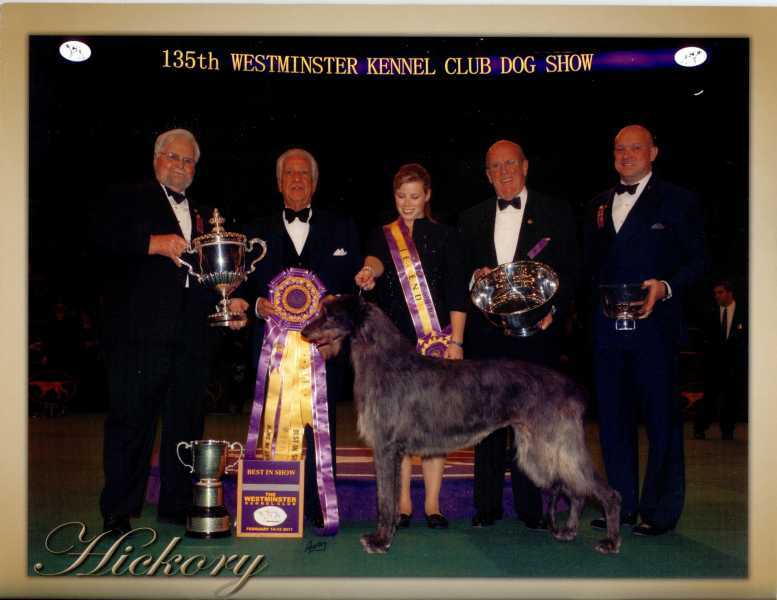 I think the "BEST IN SHOW" win from Hickory by the Westminster Kennel Club Dog Show 2011 is a very great historic moment for the Scottish Deerhound breed worldwide. 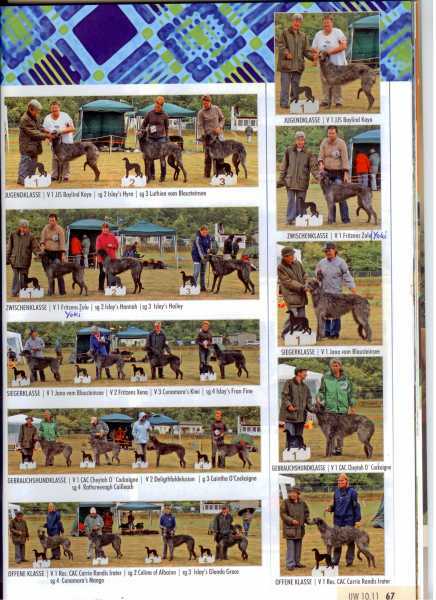 In the October 2011 issue of the German Sighthound magazine "Unsere Windhunde" was a article about the German "Deerhound Jahresausstellung 2011" in Greppin. I have scanned 2 of 5 sides of this article. 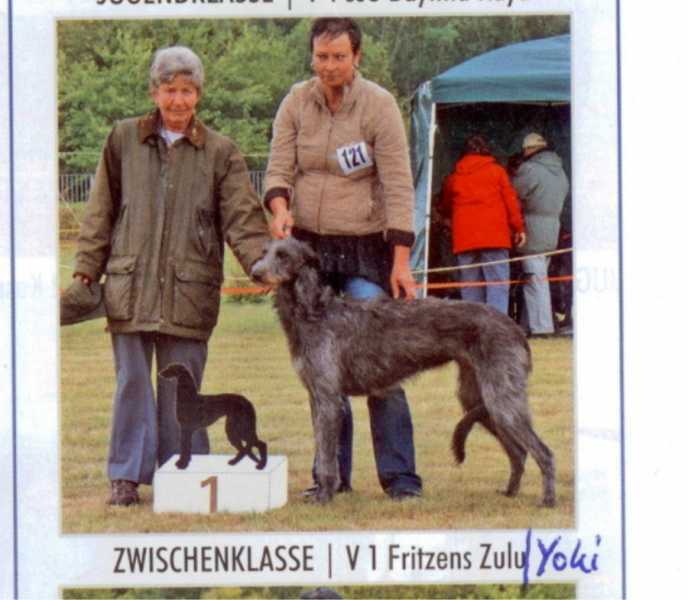 Mrs Susie Piggott (dogs) of UK Deerhound Club. Here is link to an article about Miss.Anastasia Noble in the Telegraph( ISSUE 13/Dec/2000). Congratulations, Islay's Hannah on 2, we planed a litter, Hannah x Ellioth as soon as the lady is ready! verenav wrote: Beautiful bird photography youhave on flickr doxhope - what kind of a camera do you have ? Lieve wrote: Congratulations, Islay's Hannah on 2, we planed a litter, Hannah x Ellioth as soon as the lady is ready! Unfortunately Ellioth died a few weeks before Hannah was in season. We decided to mate Islay's Hannah to Cunamara Miles, 11 beautiful puppies are born on 26 september of this year. I have send you a copy from the article (PDF) with e-mail. 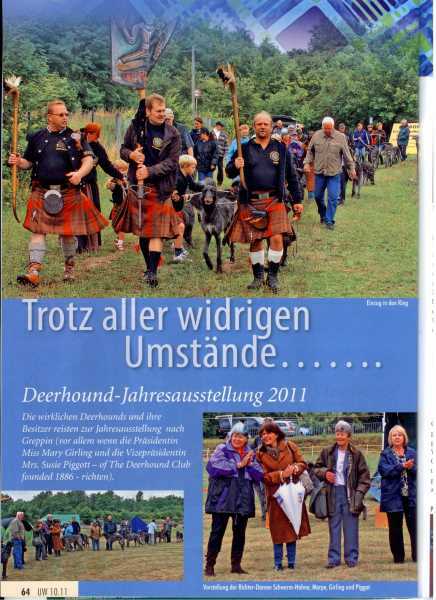 I have found in the interernet a interesting article about the hunting with Deerhounds in Austria-Hungary. für Jägerei, Hundezüchtung, Schiesskunst, Fischerei und Reitsport. Redigirt von Karl Brandt in Osterode a. Harz. This really is a most interesting article on how they hunted with deerhounds in the 1800s. I've made a copy to tuck inside my Weston Bell book as the man's dogs came from Bell's kennel. Worth a read! This is a picture of the cover of Country Life in America Magazine dated February, 1910. 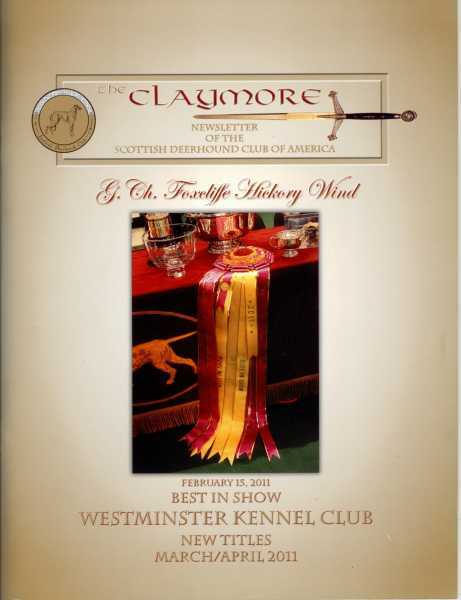 I think it is a Scottish Deerhound and a Scottish Terrier. 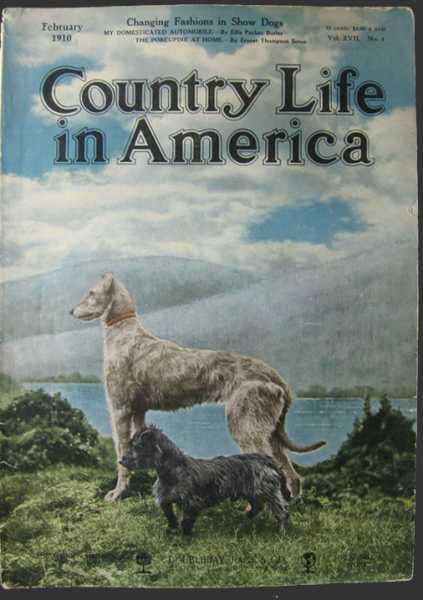 Amazing, how many times deerhounds has been on the cover of fancy magazines. Thank you very much Joerg. I have ordered this old cover in the US. I hope to recieve it in the end of next week. Just veering away from articles etc I have always looked out for Deerhounds on films and tv, theres a film called "I know where I`m going" ,its an old black and white film set in the highlands and islands (supposedly) two wonderful deerhounds in that and a recent "Midsummer Murder" I spotted a DH running with a pack of assorted dogs. There must be more.